Welcome to (what I am calling) Part 2 of my coverage of the Wheeling Nailers of the ECHL. In my last piece, I was able to portray what this team means to the city of Wheeling as well as their fans. Described as having a "blue collar" work ethic on the ice, this team has demanded and commanded respect this season and is now well into their journey to bringing home a Kelly Cup championship (the first since the team was established 25 years ago). As stated in my last article, this is the highest level some of these players may get to. But they are true players, as long as their skates are on the ice, that is all that matters. They play for the game and for the fans. 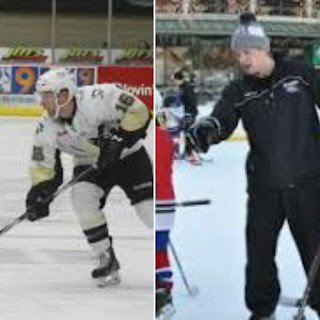 However, with that said there is no lack of talent on this team, some of which I could definitely see making a go (at the very least) at a solid AHL career and possibly garner some respect if called up to the "big show" to fill a roster slot (much like current Wilkes Barre-Scranton Penguin, Dustin Jeffery). 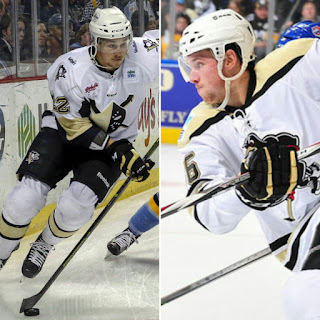 While some of these players have already got their feet wet in the AHL, others have not yet had Lady Luck smile upon them, however given the nature of the Penguin organization, luck can change at any given moment. Let's take a look at some of these fine gentlemen and what makes them worthy of (possibly) playing and staying at a higher level. Last name sound familiar? For Penguins fans, it ought to. Ty is the son of former Penguin and 2-time Stanley Cup champion, Troy Loney. 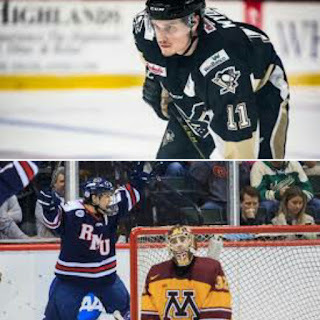 A University of Denver grad and former Norfolk Admiral, Ty agreed to terms with Wilkes-Barre this past summer. He would end up playing in 36 games with the Baby Pens but unfortunately registered no goals and only 6 assists. 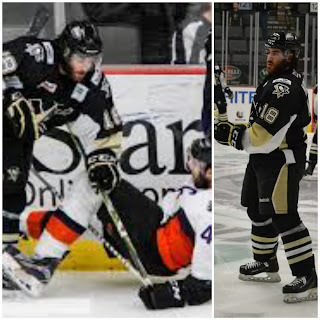 In his 31 games with the Nailers, however, Loney has 7 regular seasons goals and 4 play off goals. He had a rather good showing at development camp this past summer however he was overshadowed by (the now hot new rookie) Conor Sheary and the controversy surrounding Derrick Pouliot. He plays the body well (and for his size, be better be), and is also a skilled puck mover. I am anxious to see how he develops and if Wilkes will give him another look for next season as they have spots that could be filled with players like Rust, Kuhnhackl, and Wilson inking one-way deals with the Pittsburgh Penguins. Robert Morris University Colonials hockey stud. This is the kid that basically put RMU on the map when it comes to their hockey program. Though the team Captain was undrafted, he made a name for himself by being named to the All-AHA First Team in 2013-14 and became the first Hobey Baker Award finalist in school history. He also held the school's scoring and point records...that was until someone named Zach Lynch came along (but that's for another article). Cody is another little fireball, much like Conor Sheary. He isn't very big, but he is fast, and he can score. He has 23 goals/50pts on the season with 6 goals currently in the playoffs. Cody was also named CCM Hockey's ECHL Player of the Month in March. His one weak spot is his puck handling. While he can get the puck on net, the key to that is keeping the puck ON your stick. Cody has the potential (in my humble opinion) to move up quickly if he can get a handle on that. Drafted in the 5th round by the Penguins, Seymour signed with Wilkes-Barre at the beginning of this season before being sent back down to Wheeling. He played 12 games for WBS in 2014-15 and another 17 this past season. The defenseman scored 3 goals and tallied 3 assists in his latest stint. 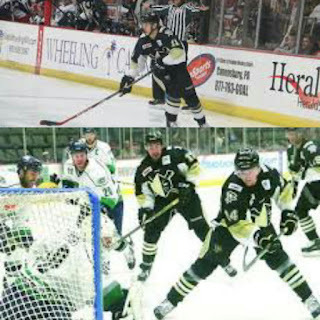 With the Nailers, Clark has 9 regular season goals and 13 assists. In the 2014-15 season, he lead all team defensemen in assists. Physically, Seymour is a brute. Plain and simple. He could be considered a skinnier version of Tom Sestitio (that can actually score) but with less of a mean streak. You do not want to get him mad though. I really should start calling him Sparky because he will go off like a firecracker when he needs to. He can lay a heavy blow that will leave you seeing stars and I don't mean Tyler Seguin. He notably tussled with former Blackhawk Viktor Svedburg on Sept. 14, 2014. Most recently, he went to blows and recorded a fighting major against Joe Diamond of the Manchester Monarchs (see clip below). Could you imagine him with someone like Brian Dumoulin? Or being back with the feisty Pat McGrath? As long as he can keep his PIM below 30 a year (which he is working on), he has a real shot to be the type of defenseman you would want WITH you and not against you. Though the same height and weight as forward, Cody Wydo, Derek Army seems to tower over anyone. He may have one of the best shots out of all of the players listed for a true, full time AHL career and maybe even a shot at the big leagues. He recently played 13 games for Wilkes-Barre where he where he put up 2 goals and 2 assists. In his rookie year alone, he put up 29 goals for 66 points in 72 games played. While he just had a professional try-out with the Texas Stars, the Nailers are happy to have this tank back on their roster. When playing for Wilkes, Coach Donatelli made mention that Derek was "knocking at the door" and was "...very close to being a full-time AHL'er". So far this season for Wheeling, he has 8 regular season goals with 15 assists with 2 playoffs goals to his credit. With a few more speed drills to better that area of his game (as well as possibly working with Gonch on his shot), Derek truly has a real chance to make a name for himself and I truly hope he gets that chance again. He may be the shortest on the list but don't let that fool you. This defenseman is built like a linebacker and knows when to drop the shoulder. He is the other player I would give a good shot at an AHL career to, maybe even the best chance at the NHL if they can overlook his height. This season, Maione lead all ECHL defensemen in scoring, was named to the All-ECHL First Team in April and was honoured by being named CCM Hockey's ECHL Defenseman of the Year. If I could compare his playing style to anyone, it would be Kris Letang except Mathew is built much stockier (which is not a bad thing). I would pay good money to see if they could play on a pairing together (the hair flow alone would be staggering). He has a tireless work ethic and great footwork which he puts to terrific use on the power play to keep pucks in the offensive zone. He employs a powerful shot, yet not the most accurate. He could definitely benefit from copying Letang's abbreviated slap shot. The sky is the limit for him but, like the rest of them, as long as he is on the ice, then he is home. The future has yet to be written for these young men. What the hockey Gods have in store for them is anyone's guess. Where they end up is up to them and the leagues. 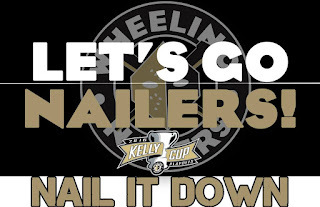 As of now, they are 5 key elements (among others) to the success the Wheeling Nailers are having in their run for the Kelly Cup championship. It is fun, exciting hockey to watch. These could be your future Hart, Norris or Conn Smythe trophy winners, who knows. 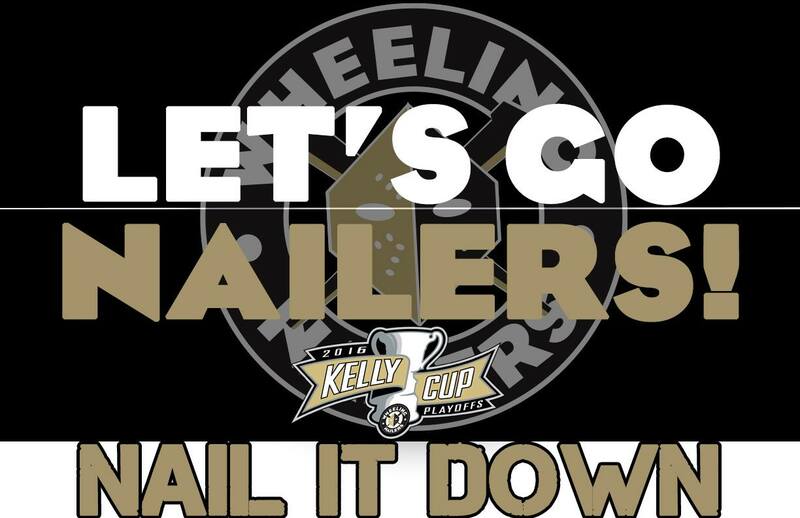 One thing is for certain, Wheeling loves them and could not be more proud to call them Nailers.